Enlist a trust assistant to do the heavy work. All photos by Pavia Rosati. This sponsored post was produced in partnership with Bounty. Bring it! Who doesn't love a big bowl of spaghetti with tomato sauce? No, really, who? That person doesn't exist. Spaghetti with a simple tomato sauce is a fundamentally satisfying, crowd-pleasing bowl of comfort and deliciousness and love. Yes, love: It was, after all, invented by an Italian mamma billions of dinners ago — Italian mammas being globally recognized as experts at delivering love on a plate. 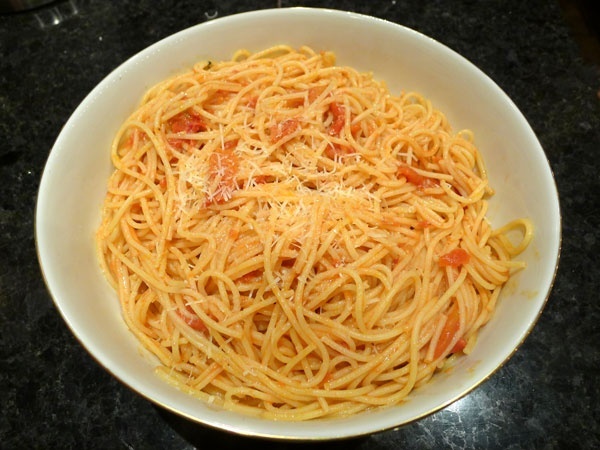 Pasta with marinara sauce, to use the proper Italian name, is so easy to make. It's a fundamental recipe that every budding chef should add to their repertoire early and use often. 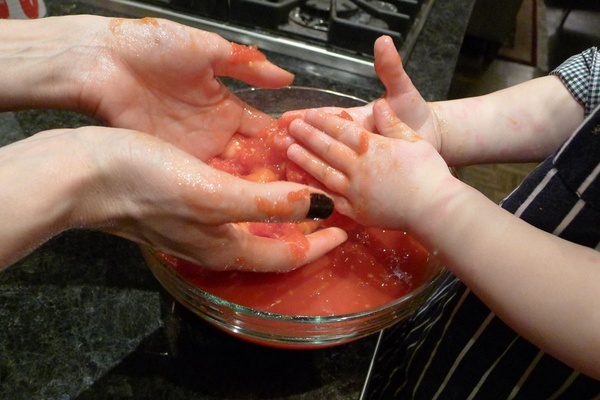 This includes young chefs, whose small hands are particularly adept at the fine art of smooshing tomatoes to ensure a great texture in the sauce. Any good Italian will insist that their — or their mother's — version of tomato sauce is the best, but that’s the beauty of this recipe. Once you learn it, you can make it your own. 1. Empty the can of tomatoes into a large bowl, juice and all. 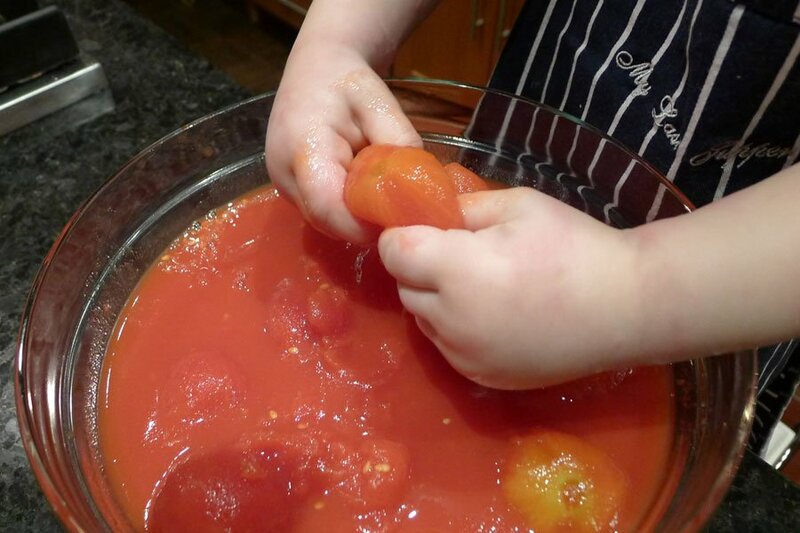 Smoosh the tomatoes through your fingers, breaking them apart into smaller pieces. Don't worry about being precise: You just want to rip them up so that you're left with a lot of texture at the end. This is a task that is especially suited to small hands. Pour about a cup of water into the can and set aside. 2. 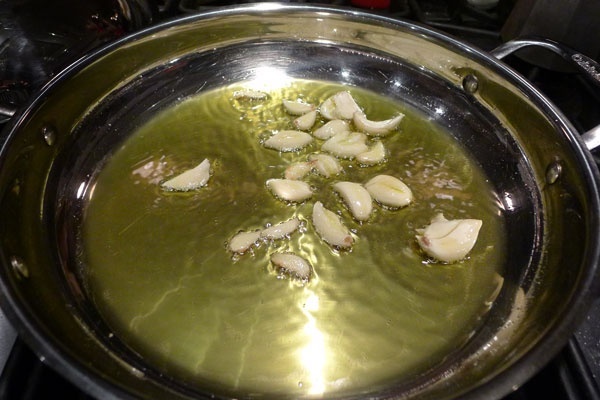 Smash the garlic cloves using the palm of your hand or the side of a knife: It's the best way to remove garlic skins and release the oils. Again, there's no need for precision. The garlic doesn't have to be finely chopped. Smashing garlic leaves it whole so it's easy to remove when the sauce is finished cooking. Italians usually remove garlic before serving their meals. Americans are the ones who love to eat whole chunks of garlic in Italian food. 3. 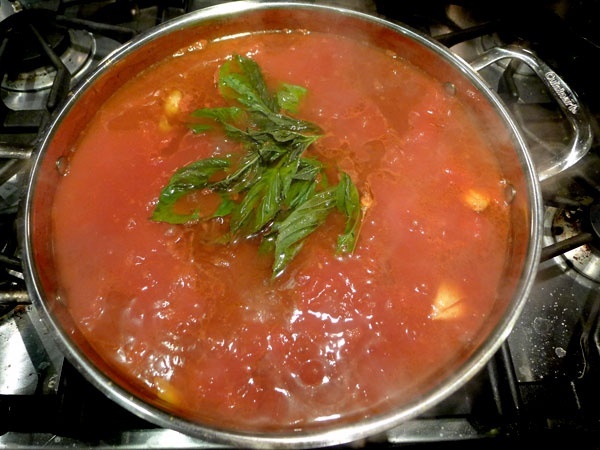 Heat a few tablespoons of olive oil in a large, shallow pan that's big enough to hold the tomatoes. After a minute, add the garlic. This is how the olive oil gets infused with garlic flavor. When the garlic starts to sizzle but before it starts to color, add the tomatoes and the reserved water. Stir gently to mix the olive oil into the tomatoes. Add salt and pepper, a generous pinch of each. 4. Add basil and gently stir again. Leave the sauce alone until it thickens. It will be ready after 15 minutes, but you can keep simmering for up to an hour if you want a more concentrated sauce. 5. While the sauce cooks, make the spaghetti according to the instructions on the package. 6. A minute before the spaghetti is ready, drain it and put it back in the pot over a medium flame. Add olive oil to coat the pasta and as much sauce as you'd like. Don't overdo it: Italians never drown their pasta in sauce. Stir the pasta with the sauce for a few minutes. This is the final step that binds the ingredients together. 7. 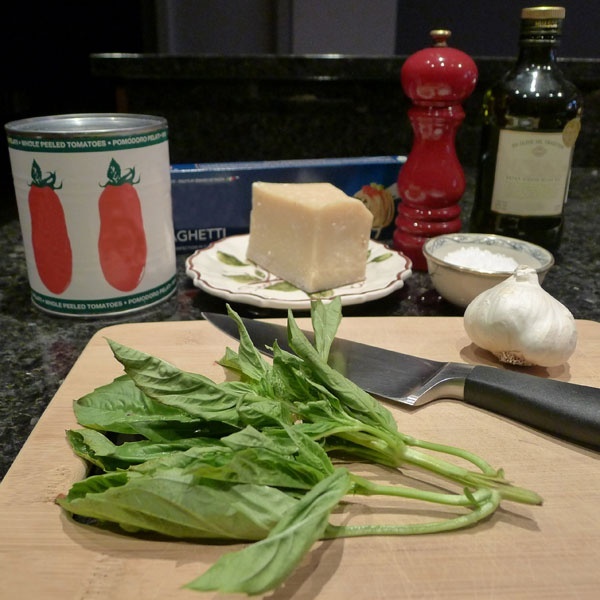 Serve with a sprinkle of grated Parmesan cheese. As for how to perfect the twirl of spaghetti like a true Italian, well, that's a skill that comes with practice. Get cooking.